www.gistgate.com is steadily rising to become one of the most visited websites in Nigeria and Africa. Thousands of people visit the blog on a daily basis to get informed and entertained. We are growing daily and our visitors and fans spread across the country and beyond. THIS IS THE RIGHT PLACE TO PLACE YOUR ADVERTS ABOUT YOUR GOODS, SERVICES, BRANDS, MUSIC PROMO, EVENT PROMO, MOVIE RELEASE AND WHATEVER YOUR HAVE WITH THE ASSURANCE OF MASSIVE VIEWS. WE HAVE THE RIGHT TARGET AUDIENCE, STUDENTS AND YOUTHS AND BUSINESS PEOPLE. OUR STATISTICS/ PAGEVIEWS ARE FAST RISING DAILY. OUR ADVERT BANNERS ARE VISIBLE ON BOTH COMPUTERS AND SMARTPHONES. WE ALSO BROADCAST YOUR ADVERTS TO THOUSANDS VIA BBM, WHATSAPP, FACEBOOK, TWITTER ETC. WE HAVE THE PASSION TO SEE YOU SUCCEED. BECAUSE YOUR SUCCESS IS OUR SUCCESS. OUR ADVERT RATES ARE VERY AFFORDABLE, YOU WON'T GET BROKE. You will have your own special page on our site where anyone can go to at anytime from anywhere to view what you have to offer. Give us a chance today to make you known to thousands. Try us today. 1. The internet has no geographical barriers. Radio and television and magazines usually cover a state or a country or few countries but the internet can be reached from almost everywhere. 2. The internet is very flexible and suits almost everyone's lifestyle. Anyone can access it at his or her convenience and at a little cost compared to other forms of media. Whether on desktop, laptop, phablets, tablets or on smartphones, it is so accessible that even children can easily find their way around the internet. So, yes. The internet is the best place to advertise. Especially if the site has a lot of page views. The more the visitors on the site the more your customers. 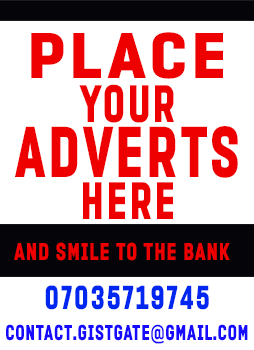 Advertise with us today. Let us take what you have to offer to the next level!!! Do You Have a Tipoff or Interesting Report? How many animals do you see on this face? Gistgate.com does not bear responsibility for comments made by blog readers. If you notice any information that infringes on your right or tarnishes your image or brand please let us know immediately. Sponsored adverts are marked Ads or Sponsored. The claims made by owners of such posts may not be verified b y GistGate and GistGate will not take responsibility for any developments arising from the transactions that viewers have with the post owners.